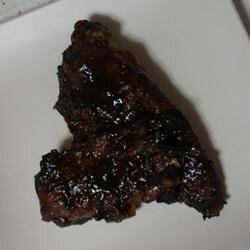 "Succulent and tender pork spareribs marinated in a soy and hoisin sauce." Simmer ribs in water for 45 minutes. Mix together ketchup, sugar, salt, garlic, soy sauce and hoisin sauce. Pour over ribs in dish; Marinate overnight in refrigerator. Bake or grill over fire for half hour. What a great recipe...simple and delicious. The ribs - and I used riblets - came out fall off the bone tender. I baked them at 350F for about 1hr, covered with foil. No leftovers here! Thanks! I didn't get to eat any but they said it was good, the thing that I didn't like about the sauce was that it burned really easy. I think I'm going to bake them next time!!!!!!!!! AWESOME RECIPE! I had to use country style ribs, as I couldn't find spareribs. This sauce is so tasty and easy! Would be wonderful for chicken too. Thanks for sharing a great recipe!